My latest lab results and final findings are coming up next! or the majority not at all, but cancer, diabetes, Aids, traumatic experiences, or any other primary issues. More tests are coming up next in order to get a statistical significance. doing a Morgellons conference on October 2018 in Augsburg/Germany. No, I am not fixing to go to this nonsense conference! Talking only about Lyme as sole cause of Morgellons, just to make money! Very probably only a handful of visitors are coming to visit it, same as in the USA. most fear to be with other sufferers in one room contracting even more fibers. Latest Lyme and Morgellons Info! but we know about a little relation to it over 10 years already! LYME DISEASE BY SEXUAL TRANSMISSION? in ticks infected with one or both bacteria in nearly every park they examined. What a surprise! CDC is waking up slowly: Lyme disease is more common than we thought? New Tick-Borne Illness Could Be Worse Than Known Lyme Disease ! because it has other surface proteins which are not recognized by usual Antibody-Tests. Oh well, not even Borrelia Burgdorferi is in most cases recognized by the usual Antibody-Crap. NHI (National Health Institute) LISTS MORGELLONS AS RARE DISEASE! Citation: Raphael B. Stricker, M.D., University of California at San Francisco. An investigation conducted by the University found that Dr. Stricker falsified data for a manuscript and a PHS-supported publication reporting research on AIDS. In the manuscript, Dr. Stricker selectively suppressed data that did not support his hypothesis, and reported consistently positive data whereas only one of four experiments had produced positive results. The same happens now with his unprofessional keratin theory, rather I would say that the filaments itselfs are just filamentous organisms and not hairs (keratin). Of course this might be good for public relations for Morgellons, but it is not useful in acknowledge or treatment of Morgellons disease at all! I don`t claim that Morgellons is only caused by spirochetes, although my long term Morgellons survey (over 18,000 cases) show that many (approx. 70%) are really suffering from a positive proved spirochetal infection. The remaining cases never had seropositive tests or Lyme symptoms at all, but shared other criteria such as surgeries, chemotherapies and various other diseases before contracting Morgellons later simply by skin contact. Yes indeed, Morgellons is contagious for immunocompromised people, because it might be an opportunistic bacteria or protozoa! I would rather ask Dr. Stricker: why he did not ask his patients how they contracted Morgellons? Is it true that spirochetes are really involved in creating colored and rootless keratin filaments? And without any root how does one explain their growth? Keratin filaments cannot rather be blue, pink, green, yellow or red and twisted together, surviving for a long time (a few years) in the environment and causing re-infection. As well, they never showed any results to prove this, as with infrared microscopy. Nor can keratin filaments release a liquid to penetrate the skin and cause further re-infection, which is clearly visible thru a microscope after one has touched contaminated papers or other objects! Morgellons filaments can be also found in fecies, the intestines, kidneys and urine and not just in the skin! Keratin filaments don`t move, change shape, or react to chemicals and hot and spicy odors, or create fuzz balls. Some Bacteria, Fungi or protozoa can do so (e.g. fungus balls) but not spirochetes! What would Dr. Wymore, the forensic lab in Tulsa, and many other researchers say about this? Did they blatently overlook and fail to recognize what are simply keratin filaments, or supposed "hairs"? Eventually many Lyme patients report symptoms of increasing grey hair and rapid nail and hair growth (e.g. beard, scalp, ear and nose hair etc.). An experienced Lyme specialist usually has knowledge of these patterns. Even veterinarians with whom I`ve spoken are aware of spirochete-associated bovine digital dermatitis (or hairy heel wart disease) and longer glassy hairs, but not colored moving fibers! Dr. Stricker and Middleveen are the only one who are now making a connection between these well known "side effects" of spirochetes and Morgellons disease! He must know as a "Lyme Specialist" that the majority of Syphilis or Lyme patients never had such Morgellons filaments, not even after 30 or 40 years of chronic Lyme disease! As he cannot establish a scientific theory based on medical history, he instead claims that Morgellons might then be a new subspecies of spirochete. Could be, but this is so superficial and irrelevant because spirochete cannot create colored filaments and they are not black at all! In all probability Dr. Stricker has not systematically investigated or listened to the Morgellons afflicted at all (in order to make comparisons and draw conclusions), despite many patients visiting him and paying dearly for much needed help. Stricker never spend any dollar for lab testings to get real data, but claiming nonsens to make money out of it! We have known for 10 years now that many afflicted with Morgellons are suffering also from Lyme disease (credit goes to Mary Laitao, Morgellons.Org). That is nothing new, but Lyme treatment alone cannot fully treat Morgellons and therefore Stricker and others from ILADS haven`t had much success in treating Morgellons or even complete success with treating long term Lyme disease. To spend upwards of 15,000 dollars, to be pumped up with many months of antibiotics or even with Ivermectin (dangerous stuff - kills brain cells! ), without any logic or strategy behind the treatment...of course you might have some improvement, but to be cured completely and forever with antibiotics alone might be wishful thinking! The fact remains that increased skin sheddings or glassy hairs (hyperplasia or hyperkeratosis) are only one of many side effects of a spirochetal or other bacterial infection and the primary focus should be on a subsequent secondary contagious bacterial and fungal infection to which the body becomes susceptible, maybe after a spirochetal infection and the accompanying reduced immune function. These side effects caused from spirochetes in the epithelial cells with its symptomatic and some information about new Lyme tests I am working on are what I explained a few months ago to one of Dr. Stricker and C. Casey associates, and it makes me wonder that the very next day Stricker posted his new article, misappropriating my information for what purpose only he can justify! I know careers could be spent crusading against bad information and plagiarism in emerging fields, but I`m tired and I don`t have time for all this P.R.! Myself is not showing anymore signs of Morgellons fibers coming out of the skin, but I am still suffering slightly from Lyme similar skin symptoms. By the way, I never was positive for Lyme disease. So what to say about that Dr. Stricker? I`m trying to devote more of my limited time to working on what will actually find a more conclusive method of diagnosing Lyme and Morgellons illnesses, an alternative to and replacement for the ineffective antibody or antigen-specific-cytokines-release based testing available on the market today. Now even ILADS claims to be working on new Lyme tests. Oh, isn`t that also a timely coincidence? This is so reprehensible because despite being long established ILADS hasn`t introduced anything truly original in regards to new Lyme tests or treatment to help the afflicted. In the end you may say, "who cares" if all the work finally helps Morgellons sufferers? I do, as I (and others) have done all this hard work for so many years while the likes of Stricker jump in and focus on an irrelevant idea and make such false claims. This might be good for some discussion and perhaps in the future for Dr. Sticker`s portfolio, and in my opinion he just copied, manipulated and falsified data to benefit from it, as he did already before. Anyway, all this might be actually not so helpful in furthering the understanding and treatment of Morgellons. Unfortunately this is the acknowledgement I often receive from the very practitioners to whom I refer the desperate patients who contact me for help. Many others are more centered on an ever-increasing paycheck than in moving the understanding and treatment of these syndromes forward. Another main problem is the fact that physicians haven`t sufficiently researched new methods and tests to preclude incorrect (or even delusionally based) diagnosis for Lyme or Morgellons symptoms, and that primary care MDs are limited by insurance companies and the denial of authorities to acknowledge Morgellons as a real disease! Thus in order to themselves make a living, many private-pay MDs and of course myriads of quacks have taken now advantage of the sick in order to exploit their desperation because they have no connections or money and cannot receive proper medical care by regular physicians. All because Morgellons has been relegated to the stupid diagnosis of "delusional parasitosis" due to the fantastic and infallible CDC report. It came out after I talked to Mark Eberhard from the CDC about this report. Scroll down to read it! So many have committed suicide out of loneliness and desperation, and just for this reason, I would love to make a lawsuit against the CDC, the Center of "NO" Disease Control! but rather the authorities and the extremes to which they go to deny Morgellons exists." Read below some short excerpts from my friendly (even if it doesn`t look like) conducted discussion a few days ago with Dr. Mark Eberhard Director of the Division of Parasitic Diseases and Malaria (DPDM) Center for Disease Control (CDC) Center for Global Health (CGH). To keep it short I left out some of his answers praising himself and the good work of the glorious CDC, and some other small talk. He took some time to listen to me, maybe because he knew me already, or because he was just curious that someone called him from Germany. Who knows? Marc Neumann: Concerning the Morgellons report by the CDC, there were however a lot of protests and many inconsistencies, in particular regarding the recognition or correct representation of this illness. Your name is mentioned also here in Germany in different articles, as allegedly you and some others represent this report in a way that makes most Morgellons patients look like delusional parasitosis patients (patients imagining parasites under or on the skin). I would like to mention at this point that this does not reflect my own opinion after I read this CDC report correctly. I think somebody just wants to misunderstand this report purposely and intentionally spread the opposite what this report actually reflects. Or is it perhaps just a matter of the vast information flow offered on the Internet, or the copy+paste mentality and the common laziness or inability to read and understand what is written somewhere. This could be actually a modern cognitive illness (perhaps ADHD?) caused by the Internet, and it will make us even more stupid than we were before then! Many cannot use their brain anymore due to this information overload! Dr. Mark Eberhard: (Laughs...) Maybe, but it is so not completely correct that we would have maintained such a thing in the report--we left everything open ended, without branding people as definitely delusional. Marc Neumann: Well, it is out there now, however, and, unfortunately, leads to the diverse opinions of some incorrect and indifferent physicians and lousy story hunters, who take only one side of the story like lemmings, without, for instance, having had direct contact with any actual Morgellons patients and treating physicians to gather real facts. Dr. Mark Eberhard: I really feel sorry that something went wrong or been abused somehow due to some misinterpretations of the CDC report. It is clear to us that there is something going on actually, but as yet, we simply do not know clearly what the actual cause of this Morgellons illness could be. Marc Neumann: Well, the fact is, that now after publication of this superficial report, all the debunkers state exactly the opposite, because the CDC left all quite uncertain in this report, right? And this uncertainty may mean for most readers: We do not have clear findings, thus patients are probably all delusional and that there is no need to treat them. Dr. Mark Eberhard: As I have said, I feel sorry for these misinterpretations. If we would know the actual cause, we would describe it all differently. Actually, we relied mainly on the investigation of Kaiser Permanente. Marc Neumann: You do not know what's causing it, but aren`t you ignoring some related facts too? I think you will be aware already that many world-wide sufferers kill themselves because they received no real medical assistance, and now more than ever Morgellons is being ignored due to this unclear CDC statement, which sounds a little bit ironic to me, as many of the Morgellons patients suffer from proven Lyme disease or similar bacterial infections. Do you know this fact either, or do you want to ignore this intentionally too? At least these patients should not be rejected by physicians and should be tested and treated at least for bacterial infections, independently of the Morgellons syndrome. With this general ignorance of facts, even regular Lyme patients have to fight daily and are very often declared as simulators, fakers or hypochondriacs by this miserable and inhumane medical system. My comment: It all just has to do with money. No money actually means, you get no further help and you have to die! How much is a human life actually still worth in the U.S. nowadays? Ten cents, or even less? On the top of that, how can one assign an investigation to this corrupt Kaiser Permanente hospital chain? It might be the same as asking Satan for support then! Dr. Mark Eberhard: However, the case is closed for the CDC at the moment, that's all I can say about it right now. Marc Neumann: Come on, what's closed? Nevertheless it still has to do with human lives, does it not? I mean, your own citizens and taxpayers, whom are left on their own with this illness. Do you know that the whole world looks on the CDC report, and this does not give a good picture to the rest of the world. Especially that the U.S. wants to refuse medical assistance to its own citizens suffering from Lyme or Morgellons disease. With due respect, we are talking meanwhile about a pandemic, if you don't know this yet either! I do not call you just because of a local hay fever outbreak, and I just don't run my site for the past seven years now to support U.S. and worldwide sufferers just for pure fun. This would however, actually be the task of the medical system, don't you think so? Dr. Mark Eberhard: I can understand that and thank you for your good work, but nevertheless I must repeat myself and say that the case is closed for the CDC. Marc Neumann: Sorry, but not for me, and I do believe that huge dark clouds will cross the CDC in the future, as the case is still not closed for many! Does the CDC have a real interest in clearing this case up at all and to help their fellow citizens? Anyway, is the CDC still paid by tax funds or not? The CDC even promotes with this unclear report those who are believing in all these wild conspiracy theories, like Chemtrails, Nano-robots, Illuminati and population reduction, etc. After all, do you believe in those? Marc Neumann: But anyway, after the Tuskegee Syphilis experiments in Alabama and Guatemala, which were led even by the U.S. health authorities which have been abused African-American and Central-American men as human lab rats, I could actually be more predisposed to believe in a newer, improved and quiet variant of a spirochete-based bioweapon as result of this study! For what was this Tuskegee experiment led 40 years long, then? Where and which are the actual results of these despicable studies? Isn`t it a shame for US, that these poor people have never, ever received medicines and even the local physicians were threatened with license withdrawal, if anyone would try to help these people. Isn`t it precisely the same story running now also with Morgellons sufferers, not anymore locally but globally? Is this all pure coincidence, or the already long-known procedure of U.S. authorities, in order to suppress the truth in the usual stupid way, just by ignoring and manipulating everything? Dr. Mark Eberhard: In addition I cannot say anything about! Marc Neumann: Really? In order to remain on solid, factual ground, let me directly give you a few pieces of information, since indirectly the CDC quite frequently visits my Internet site. The fact is, nevertheless, that we have epidemiologically, morphologically and biologically many similarities even to a kind of fungus or fungus-like protozoan infection. Quite similar to what arises in California and southern U.S. states with fungi, such as Coccidioides immitis and Microsporum canis. Even with the Coccidioides immitis fungus, scientists have found new mutations of it never known before. Usually known as a fungus, where its hyphae always roll themselves together into spherical shapes (cocci). According to old scientific studies, this fungus cannot create long thin hyphae in the host body, but under certain stress conditions, they found out in the latest results that these and other fungi or bacteria really can. Why does the CDC not do any research in the direction of such filamentous microorganisms at least? Dr. Mark Eberhard: These sort of infections are well known to me, but we do not as yet have evidence connecting these and other types of infections to Morgellons disease. Marc Neumann: Allright, but it is more than evident that it must be a kind of fungus-like, perhaps a mutated form, causing Morgellons. In addition, epidemiologically, is the spreading caused either due to global warming, or is it because of a massive forced usage of fungi and other pathogens used as biological insecticides embedded in hollow fibers, which have been used for approximately 30 years now to fight fire-ants and all kinds of crop pests in the U.S.? Even ticks and mosquitos are now fought with such biological insecticides in forest and meadow areas. What happens with the pathogens that these pests carry, if they get eaten up by such organisms which spread uncontrolled later? In addition every new technology, as these fibers with embedded pathogens, can be used also by the military or any other evil fringe groups to spread diseases, right? Marc Neumann: Furthermore, it cannot be as the CDC states, that this Morgellons illness is not contagious. How can all concerned have been infected then. What kind of research has the CDC actually done? Besides, if one ignores the delusional theory now, the question must be, why so many mammals have been infected, and why even a worldwide spread could occur! Myself and others have investigated that over many years, but the CDC did not! Marc Neumann: Anyway, do you have any idea at all, what harm the CDC has caused with this unprofessional statement? It means gross negligence or deliberate bodily injury directly caused by the CDC. I think, there will be many more complaints and lawsuits to follow! All family members, who have a weaker immune system, from the child up to the parents and grandparents can be infected, and also neighbors and pets, can be affected by it! Mainly these filaments are actually spread by direct body contact. If you are too weak, you will lose! Dr. Mark Eberhard: Well, according to Kaiser Permanente and other researchers, it doesn`t seem to be contagious! Marc Neumann: What? Sincerely, I cannot understand this careless attitude of the CDC which drives many humans into financial and physical ruin! Even if I can understand, to some extent, this stance for political and economical reasons, that the CDC may never admit that there are these and other contagious diseases present at this time in the U.S. at all (excluding now bed bugs in New York and Lyme disease epidemics in 49 U.S. states). Just because no more tourists would visit the U.S. or goods from the U.S. would be rejected by other countries, as it happened already with beef that was contaminated with BSE (Bovine Spongiform Encephalitis, or Mad Cow Disease). Korea and other countries nevertheless sent back such supplies, did they not? Are U.S. citizens at least informed at all about the fact that BSE is still present in the U.S.? Dr. Mark Eberhard: Hmm, I would not like to say anything about such claims, but yes indeed, the CDC has to be careful about such statements anyway. Marc Neumann: Well, the truth was always too precious, so it must remain hidden behind a lie, even ignoring human lives, right? Marc Neumann: To finish this call, if I would send you from this living organic liquid (protoplasm), which is actually embedded in inorganic hollow fibers first (polymer-carriers), the extracted DNA by simple means, would the CDC do any DNA sequence then to find more out? Do you have any interest at all in it, since the CDC allegedly still could not find anything that causes this disease? Dr. Mark Eberhard: What, DNA? No (inaudible), I must unfortunately break the discussion off now, sorry. Marc Neumann: Now, well, thanks anyway for your time and the informative discussion and bye, bye. This latest Youtube video (part 1) shown in German is a new documentary trailer made with my collaboration. There will be more video parts which will be subtitled in the future in English. Even if you do not understand anything now, just watch the first few minutes and the darkfield microscopy pictures shown at the beginning. It shows according to my research, hollow filaments or hyphae (sometimes with a kind of hook) with an embedded biomass (protoplasm), with integrated particles and/or DNA cell cores. This biomass is growing out of the fibers in slow motion (over hours) creating new hyphae or blebs/bubbles. It is exactly that these new created forms with a typical biology of fungal organisms, which have left the hollow carrier fibers, have to be investigated more by DNA tests to find out the pathogen which is causing the Morgellons disease. Many researchers looked only on the surface of the fibers instead of looking inside of them to come further! Therefore, I would call some researcher just dilettantes, or even corrupt because they won`t find out more maybe on purpose, as it might not be in their best interests! Many patients have written to me that they were not satisfied at all with blood tests and treatments performed by BCA. By patients, I mean Germans and foreigners who even moved to Augsburg, Germany, from other countries for Lyme treatment. Their concensus is that BCA diagnoses mostly chlamydia but rarely finds Lyme disease, even in cases where there has been other evidence of Lyme. Treatment at BCA resulted in no substantial improvement or healing for the most of these patients, only further disappointment. I have never received any treatment from BCA, though I contacted them initially (2008) regarding research on Morgellons illness. I expected reasonable cooperation from them, but, unfortunately, my experiences with their team of physicians were unsatisfactory and comprised of unfulfilled promises and inadequate laboratory equipment (e.g. a 30 dollar microscope for kids). After many information requests yielding poor response, I can only conclude that BCA is doing no substantive research (clinicians and scientific research? no way!) and has no notion of Morgellons or how to treat it! The fact is that I would like to have nothing further to do with the BCA Lyme disease clinic, nor with most physicians of the ILADS group, most (though not all!) of whom require enormous sums of money for treating Lyme patients, abusing the situation of desperate patients who been ignored from regular physicians. My personal opinion is that BCA jumped from the Lyme to the Morgellons bandwagon, for the purpose of attracting also more Morgellons sufferers now with empty promises! Furthermore, BCA's basic claim that Lyme disease is curable (also in the final stage?) is more than despicable to myself and many other patients and German Lyme associations and foundations. Every other laboratory and physician in your own country can do the same job just as well. You don't need to come to Germany for treatment, just because you may think that German medicine is superior! Medicine for Lyme and Morgellons in Germany, the USA, and many other countries is mostly the same standard-crap! Actually, it is really funny (both strange and amusing) that American Lyme patients come to Europe for treatment, and Europeans go to the USA for the same. What travel madness that is, and all based on mistaken presumptions and hope! So, it is up to you, individually, to choose whether you use BCA or not. Global Challenges in Diagnosing and Managing Lyme Disease - Lyme Disease Association, Inc.
After many years of struggling with Morgellons disease, Joe Mistretta passed away on May 13, in Niagara, NY. This year in Lafayette Park in Washington DC at the Whitehouse Lyme Patients and family members from all over the world will come together to demonstrate how Lyme has affected their lives. Last year Lyme patients gathered in front of the White House in Washington DC to protest the wrong guidelines that the IDSA (Infectious Disease Society Of America) states for treating Lyme Disease. IDSA, released a report that is the official guideline for doctors worldwide for Lyme disease treatment. It is shockingly ignorant, and devastating for Lyme patients. It basically says, "Lyme disease is all a delusion." This is very bad news also for Morgellons patients. This has sent shockwaves through the lives of Lyme patients. Based on Kaiser Permanente zero value research. What a coincidence that Bayer and GlaxoSmithKline paid out 258 million in fines for defrauding the US Medical system in order to provide discounted prices to Kaiser Permanente. "time is on my side....yes it is!" In the meantime, occupy CDC!! Doctor who has changed his tune towards Lyme Disease! and it might be possible to obtain a home-unit from MEDICARE if you are housebound or disabled. MAYO CLINIC REPORT IS JUST A BOGUS AND AGAINST SUFFERERS DIGNITY! retrospective review of Delusional Infestation cases seen at the Mayo Clinic between 2001 and 2007.
from small-brain debunkers! Why now, did they pull out this old study from 2001-2007, 3 years later, in 2011? What comes next, "GONE WITH THE WIND" gets another Oscar?? Is Dr. Sara A. Hylwa even a real person? A job well done, from those who want to discredit Morgellons disease. Who is behind of all? BAYER AG? Almost all Morgellons sufferers do suffer from Lyme disease and an unknown fungus-like pathogen. American Medical Association Release "Morgellons is systemic"
Small Bowel Capsule Findings Suggest that Morgellon's Disease has an Organic Basis and is Not Psychosomatic in Origin! Daniel Chao, MD, David Cave, MD, PhD University of Massachusetts Medical Center, Worcester, MA. Purpose: Background: Morgellon's disease is a poorly described, severe ulcerative skin condition that histologically is consistent with dermatitis artefacta. It has therefore been dismissed as a psychosomatic disorder, much as was the case with ulcerative colitis in the period from 1930 to 1960. We present the first case of a patient with Morgellon's syndrome who had additional findings suggesting that it is a systemic disease. Case report: A 65 year old white female presents to us with an unexplained iron deficiency anemia. She had a history of systemic lupus and a 2 year history of severe skin ulcerations. The ulcers contained fragments of black material. She had been seen by multiple specialists who told her that the lesions were self-inflicted and that she should get psychiatric care. Physical exam was of note for numerous papules with erythematous, ulcerated centers measuring 2 to 12 mm located on the trunk, back, upper and lower limbs and outer ear canal. The ulcers were notable for sharply angulated corners and clearly demarcated edges. She had extensive scarring on her arms and legs. Her labs were notable for a hemoglobin of 9.1 g/dL with MCV 83.3, serum albumin 3.4, and ESR 32. ANA was negative. She had recently completed a course of intravenous iron. A video capsule was performed. This showed denuded villous patches in the jejunem, which were unusual for their sharply angulated appearance, similar to her skin lesions. 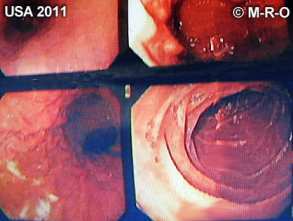 Small bowel biopsies were normal. Skin biopsy showed hemorrhage and non-specific inflammation. Histology of the black debris from her ulcers suggested vegetable matter. Repeat capsule examination 6 months later showed spontaneous resolution of the denuded patches. Occlusion treatment on one limb led to some improvement. Discussion: This patient demonstrated cutaneous ulceration consistent with Morgellon's syndrome, but she had co-existing evidence for systemic disease with iron deficiency, low albumin and small bowel villous changes consistent with a mild enteritis. This is the first time that evidence for systemic disease has been demonstrated in association with what has previously been considered a disorder limited to the skin. Further investigations are warranted in a larger patient population. New, deadly and so far incurable Murine leukemia retrovirus found in immunocompromised individuals and now also in Morgellons sufferers. They don`t know much about MLV-XMRV and contamination processes except that it can be given by blood transfusion and animals. This was initially a virus found only on mice but it has mutated and adapted to humans. Therefore I must repeat it again: you need to test not only bacterial infections but also fungal and viral infections followed with appropriate treatments. This virus is triggered by stress hormones as cortisol and female hormones. German Morgellons sufferer committed suicide! I am deeply saddened and speechless about this very sad story, which took place in my region of Germany. I was in contact with Monika on a few occasions, but she was already so exhausted by the fight against her condition. I feel so sorry that I could not help her more! After a nightmare of many psychatric hospitalizations and ingnorance of all doctors she planned her death and arranged her private affairs months in advance, before jumping to her death from the balloon one week ago. In her last letter, she wanted to help other sufferers with her death, to force authorities and doctors to be more aware about the Morgellons disease and the immense suffering it causes! She wrote that she hoped her death would not be in vain, not senseless at all! Please pray for her. How many poor people must still die, until the media, politicians and the medical profession wake up? What a shame for humanity! Open story of a Morgellons sufferer wearing plastic bag at home, day by day! FIRST GERMAN LYME CLINIC THAT ADMITTS MORGELLONS TO MAKE MONEY!! After a lot of work and evidence from me to convince German physicians that Morgellons disease is real, I finally succeeded. The Lyme clinic (BCA) in my own hometown now states officially the existence of this disease called Morgellons. Latest information: I did split from them now due to many complains from worldwide patients!! The clinic attests to Morgellons disease for their patients, but mainly to make more money without accurate serology or treatments. Myself and even most German Lyme association or foundations gives them no more credit at all! "MYIASIS", "FILLAN" AND "THE MORGELLONS"
Despite that many are believing in Chemtrails as cause of Morgellons, read this "British Medical Journal" article below from 1946 send to me from a sufferer a few weeks ago. You can believe that it`s a fly, worm, fungus or what ever you want, but don`t tell me that all comes from Chemtrails and they want to kill us with parasites coming down from the sky!! There are many other reasons as possible cause but not Chemtrails or UFO`S!! And yes, also flies can carry fungal spores, viruses and all sort of bacteria. Chemtrails are real but Morgellons disease is not caused by Chemtrails! Most of the facts speak against that theory!! If Morgellons disease came from Chemtrails, we would see a larger number of infected mammals. Logically, one drop of any virus or similar substance dropped into any water treatment plant would more efficiently deliver disease than visible striking or spraying actions!! Chemtrails (light-reflecting polymers) are sprayed mostly over the carbon dioxide (CO2)-producing major cities and serve only to stop global climate warming. This is done by covering cities with an artificial, cloud-like shield to reflects UV light and perhaps to absorb CO2, thereby reducing the average global temperature. I am one of the many RNs with this dread disease. Early on, I had an MRI Scan done (head) that revealed lesions in the white matter of the brain. These could never be explained. I have always felt this was a significant finding in Morgellons Disease especially when I learned of others with this same finding. Presently, I am working with some qualified doctors ( neurologist, radiologist, etc.) to review as many of our MRI scans as possible to see if there are any commonalities or other issues within them. If anyone has had a MRI Scan of the brain (head) since or even prior to contracting Morgellons and would be interested in taking part, please send me an email at sunnyand7777@yahoo.com If this works out, there should not even be a cost since most medical facilities will send scans, reports, etc. to another medical provider at no charge to the patient. I sure hope this continues to be true. I will be getting back in touch with everyone sometime after Labor Day. I don&rsquo;t want to miss anyone that wants to be included.. Anyone planning to have an MRI scan in the near future can email me, too. Just put &ldquo;MRI Scan Upcoming&rdquo; or something like that. Say prays and keep the power of God with us. Please pass this request on to others who might be interested. Kaiser Permanente is visiting my site quite often. If they really want to help sufferers, why they don`t even try to contact me? They, among others, can just visit me anonymously to see what I have found out or not. So, they do really have no clue about and they get even payed therefore visiting my site!! Is that their kind of investigations on Morgellons disease? Kaiser Permanente did get last year 330.000 Dollar from CDC to investigate on Morgellons disease. For what? And this year?? And how much money actually did they have received from Monsanto or Bayer AG, to be quiet, how much?? We really want to know it!! Also the CDC (center of no disease control) comes sometimes on my site. They should rather give to me that money and they will get more regarding doing research. Do you really think that anyone of them has the will or spirit to contact me, just to help all U.S. sufferers and finishing this nightmare soon? I know you have already lost your money, home, work, partners, friends and health and nobody cares about you anymore, and many are living already in their cars, due to the lost of their homes and jobs. PRODUCTS OR ABUSING MY CONTENT FOR OBSCURE PURPOSES ARE NOT ALLOWED TO COPY FROM M-R-O !! !